I love breakfast. I eat it every day. Most days, it’s whole wheat toast with peanut butter when I’m running out the door. But on those lovely lazy days when I’m home with my amazing husband and adorable little lady, I make breakfast. This tart is a favorite. Easy to put together, but looks and tastes very impressive. Place the puff pastry on a sheet of parchment paper and roll with a rolling pin in each direction a few times to make the pastry thinner, wider, and longer. Transfer the pastry, and the parchment paper to a baking sheet. poke several dozen holes in the puff pastry to avoid large air pockets from forming. Bake at 350 for 15 minutes or until a light golden brown. Allow to cool a bit. In a microwave safe bowl, add the butter and pesto. Microwave for 20 seconds, stir and repeat until melted. Brush all over the pastry with a pastry brush. Top with chopped basil, chopped bacon and chopped red pepper. Place the asparagus flat on a cutting board, hold the stem tight with one hand, and with the other, shave the asparagus with a vegetable peeler. Crack 4 eggs directly onto the puff pastry, one in each corner, avoiding the edges. Leave at least a once inch gap on all sides. I love a runny yolk. LOVE. It’s natures perfect sauce. And Safest Choice Eggs are pasteurized so I can serve them without fear of ruining my perfect breakfast memory with a nasty bout of Salmonella poisoning. It’s pretty genius. Sprinkle with the shaved asparagus, then with the salt and pepper. Bake at 350 for an additional 15 minutes, or until the whites of the eggs have set and turned white. Cut the tart into four squares. Wow, that does look impressive! I’m with you–most of the time breakfast is at my desk, but it’s nice to do something special on the weekends. Absolutely! Saturday breakfast is my favorite meal of the week. What a great breakfast idea. Breakfast is out favorite meal of the day, and some days we have two. We like to have breakfast for supper, that isn’t weird is it? Going to have to try your pesto tart one night, thanks for sharing. Breakfast for dinner was my favorite when I was a kid! 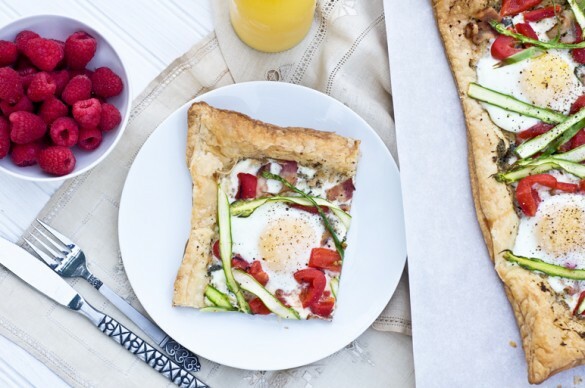 What a gorgeous breakfast tart, this looks so delicious! Love your pictures! Thank you! I’ve only been photographing food for about 6 months, so it’s still a work in progress! Wow, my hubs would go nuts for this one. I am not a breakfast gal, or an egg gal. But he’s a big fan of both. He’s going to flip when he sees this. 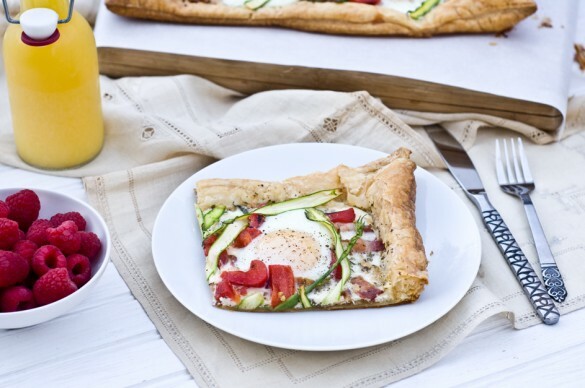 When there’s puff pastry involved…I’m in! Beautiful photo. My mouth is watering! This looks amazing!! !